Eary Cushlin01624 648000work Self-cateringEary Cushlin is renowned for its dramatic scenery, with heather clad slopes leading down to the sea. This stunning property benefits from a spacious living room, separate dining room, large kitchen with breakfast bar, boot room, downstairs shower room and upstairs bathroom. Four bedrooms are available including a double room with 6ft bed, twin room, triple room (with both double and single beds) and a bunk room. For guests unable to use the stairs, an additional king size sofa bed is available in the lounge. Wifi, TV, Games, Books, Binoculars and maps available. Situated on the Raad ny Follan, the Isle of Man’s Coastal Footpath, Eary Cushlin is ideal for walking, mountain biking or enjoying the peace and tranquillity of the countryside setting. 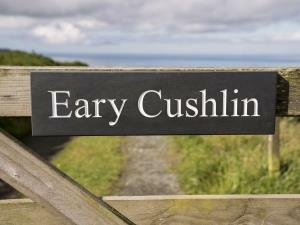 Eary Cushlin is renowned for its dramatic scenery, with heather clad slopes leading down to the sea. The property is owned by Manx National Heritage, the Isle of Man's National Trust, with proceeds from your stay helping to maintain and protect this stunning area of the Isle of Man.